In Attack on Titan (AOT) Wings of Freedom, your combat performance is evaluated in different ranks, the order is C, B, A and S. Only when you reach an S rank you get extra rare materials as a reward to make advanced equipment. In this guide, we will show you how to attain the S rank in every mission. The overall rating is made up of three sub-disciplines. - Fight time: The faster you complete the first two points, the sooner you get the S ranking here. The timelines are not too strict and as long as you remain in most emissions below 20 minutes, it should not be too many problems. - Submissions: The more Titans you defeat on the battlefield, the sooner you get the S-Rank. To do this, defeat just about all Titans in a mission and must not leave too many red dots on the map. - Missions completed: The more side missions you have completed in addition to the main missions, the better. For an S-rank you should try to complete all side missions in a battle. - You have to reach an S rank in each of the three branches to obtain the best possible rating. For example: in the submissions, if you get just A rank and have the other two categories S, you still get a total of only the A-rank. - Complete each side mission from the battlefield as soon as they appear. They are marked by green exclamation mark and bring you also a new advantage on the battlefield (guns, traps, inventories) and strong team members, accelerate the mission progress by its combat power on. - Avoid unnecessary travel and quickly defeat any Titans you encounter on the way. - To achieve an S rank, you should never stop unnecessarily for too long with Titans and directly attack the neck. You should refrain from collecting additional materials by separating parts of the body during the hunt for the S ranking. - For the missions you should use your strong characters like Mikasa or Levi. Alternatively, you can use Erwin or Eren for the missions. The S-rank brings you not only a better overall result, but also you get additional rare materials that you need to produce the most advanced equipment in the game. Additionally you get diverse achievements and trophies, if you manage to complete a mission on S - rank or even all the missions of attack mode. The fatal submissions will be released after completion of the last main mission. This additional special mission will be added in the missions. This you can see at any time under special mission in the pause screen. The target for the fatal submission on the battlefield is marked by a gray exclamation point. 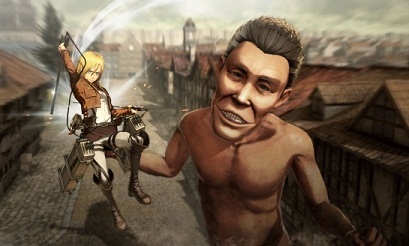 Here you will encounter stronger Titans. If you manage to defeat them, then you get additional and even more valuable materials just like when you reach an S-rank.